Thorgerson’s image-making, nearly always for music clients, is based around photography, and the creation of grandiose, retina-searing images that become indelibly associated with particular albums and bands, however tenuous or obscure their representation of that music. To demonstrate his methods, he asked us to take part in what might become a typical Thorgerson image – a photograph of the entire, 1000-strong audience covering their faces in mock horror. He gestured with his one good hand at the Cranberries picture overhead. ‘This picture is a real event … I can only do what I can see.’ He explained that the image was made using hundreds of red gym balls, dropped from a tower erected on an English beach. The first run of this real-life, real time event was so extraordinary, he said, that the photographer forgot to open the shutter. 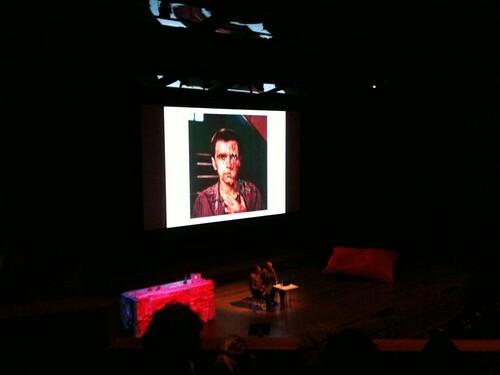 Thorgerson, in conversation with Integrated organiser Hugo Puttaert went on to show a whole sequence of vivid images for acts such as The Mars Volta, Audioslave, Ian Dury (above) Led Zeppelin (below), Peter Gabriel (bottom) 10cc and Pink Floyd, the band with whom he’s most closely associated. 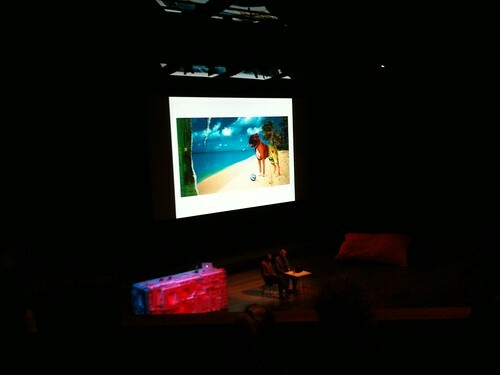 Thorgerson, still turns out limited edition prints and books based on their back catalogue. 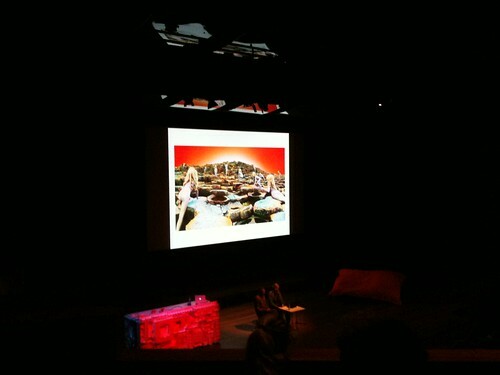 Some of the images he showed had specific meanings, such as his ‘critique of women’ (above) or 10cc’s Are You Normal? – the defining sheep-on-couch-on-Hawaii-beach shot. 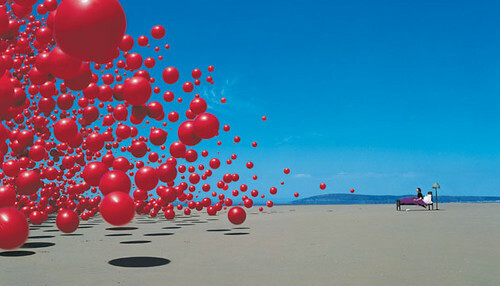 But often, Thorgerson claimed no knowledge of what his images meant. They made him laugh, he said. Albums like XTC’s typewriter font Go2, (celebrated in Dot Dot Dot) or Almighty’s Do You Understand? Or the six different highly elaborate covers for Led Zep’s In Through The Out Door, which they inserted in brown paper bags. ‘We thought it was funny,’ he said. His anarchic yet bossy manner makes him sound like the seventh member of Monty Python. Half the audience were students, born long after CDs began to kill off rock album art, and few of them knew Thorgerson’s name. Yet they knew the Pink Floyd covers. 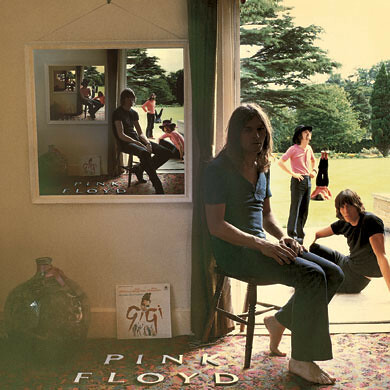 Dark Side of the Moon, Wish You Were Here (with its burning businessman, and George Hardie lettering and artwork) and the receding infinity of Ummagumma (above) have acquired iconic status. This wasn’t the last cow (or Python-like moment) of the day. 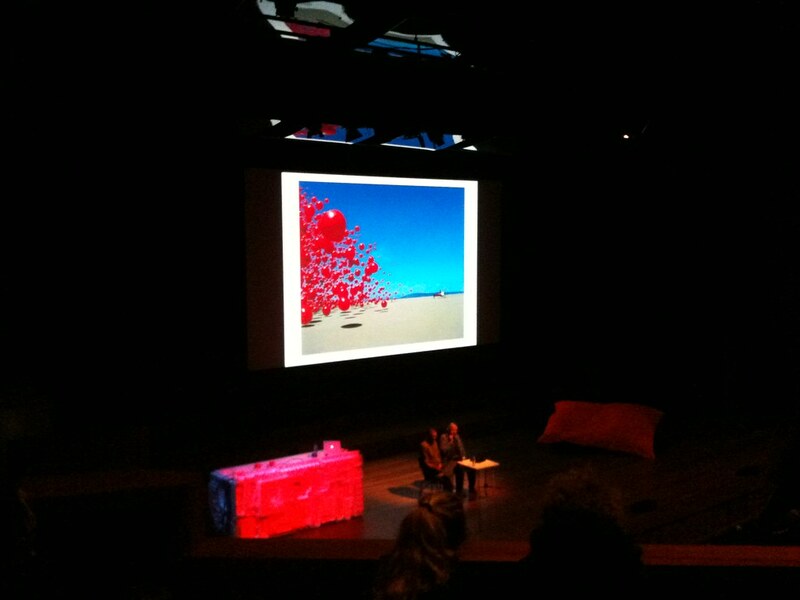 A few hours later Erik Kessels made an unwitting cross-reference to this with his Useful Photography, and a short film about the difficulties of photographing a cow (an enterprise requiring half a dozen harassed Dutchmen and a car stereo). But by then, Thorgerson was on the Eurostar back to Blighty.